Interview w/ Roy Jones Jr.
Congratulations on your recent victory over Max Alexander. How long does it normally take you to heal up after a fight? At this stage of your career, can you see yourself moving down a weight class or two? No, only of great opportunity and budget is superb. Outside of boxing you have been involved in tv, music, and film. Will we see you continue any of these ventures? How do you feel about the state of boxing? When people ask why is Roy Jones Jr still boxing, what do you say to those critics? Because I have one title that has eluded me an I want to try and get that title before I retire. There was a rumored potential battle between you and Bobby Gunn, that fell through as Gunn is scheduled to fight James Toney. Who do you want to fight next? Who is a boxer today that possesses some of the qualities that made you such a great fighter? If you had the opportunity to fight anyone past or present in any weight class, who would you choose? Why should inner city kids start choose to box rather than play basketball and football? 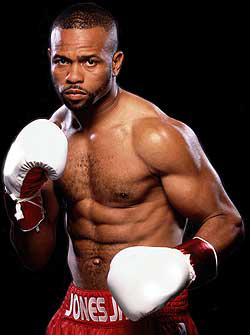 Everyone knows who you are as a boxer, but Who is Roy Jones Jr the man? A philosophical guy that is very passionate and considerate about his actions. Thanks for your time. Any last comments for your fans, supporters, naysayers? Fans: Thanks for the support you have given me throughout the years. Supporters: thanks for being behind me, you give me the push to get up and go when days I don’t feel it. Naysayers: I’m sorry you feel the way you do. The ones that are concerned, thanks for your concern. The ones that are just a naysayer go do something positive in your life, so that someone can be a naysayer about you. This entry was posted in Interviews, Sports and tagged Blended Entertainment, Bobby Gunn, Boxing, Celeb Interviews, Entertainment, James Toney, Max Alexander, Sports, Sports Interviews. Bookmark the permalink.